Kimbra Johnson was born and raised in New Zealand. Her parents worked in the sphere of medicine, and they did not have the straight connection with art. Still, Kimbra had a great number of reasons to fall in love with music. She started to write songs when she was only ten years old, and two years later the father of the future singer made her a gift - a guitar. Kimbra started to learn to play the instrument with a great pleasure, so pretty soon she performed on a stage with her teacher. It is definitely worth mentioning that Kimbra was never taught to sing – she had been mastering her vocals by her own. And she managed to achieve amazing results: the singer took part in the national competition Smokefreerockquest and got the second place there in 2004. That victory gave her more confidence in her own strength, and Kimbra decided to keep on moving forward. She presented her very first music video titled Smile at the children show What Now. Just like this, step by step, the young artist was coming closer to her main aim. Her single called Simply on My Lips made a real furor in 2007, and what matters – she was only seventeen then. Her talent was noticed, so Kimbra got a contract from a label Forum 5, which was based in Melbourne. Thereby the performer moved to Australia and began working on her debut studio album. In spite of all victories and achievements within Kimbra’s motherland, the young singer is not known by a truly great number of music lovers yet. She has just started making steps towards the musical Olympia conquest. Well, is not it the most curious stage for the listeners, after all? Nobody knows what to expect from Kimbra, and that is why her compositions are so extremely interesting. The release of promising long play from Zelanian singer finally took place, and now everybody can get acquainted with her creativity. The record Vows is opened by the track Settle Down, which proudly presents interesting rhythm. But the most important thing is that we can enjoy the artist’s vocals in a full volume from the very first composition. The second song Cameo Lover is more pop-oriented, but it has its own charm and at the same time it is a fancy ground for Kimbra’s voice. She plays with melodies so well that it will not give anyone a single reason to be bored. Good Intent is another proof of the fact that Kimbra knows what the melodiousness is: arrangements simply do not possess useless elements, but there is a real freedom for the singer’s voice. An excellent tactics, indeed. The record Vows with its total length of almost an hour, brings the original cocktail of genres to the listeners. It has a slow, mid-tempo rhythm and blues - Plain Gold Ring, bright funk - Call Me and pop - Wandering Limbs. The most impressive thing is that all these directions complement each other and do not create genre discordance. 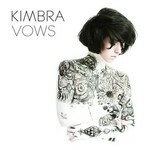 Fast or slow, compositions of Vows are to demonstrate Kimbra’s outstanding performance skills. Her voice can sound clean or on the contrary, gain a little bit of husk. In any situation, the artist emphasizes melodies or creates them – the arrangements let her giving a way fro the creativity. Well, eleven songs from the record managed to produce quite a strong effect and to prove that Kimbra has an excellent intuition. First of all her songs are original and also they do not copy each other. There is no doubt that the debut album proved to be a success. The artist has a long way to go, and we can just look forward to enjoy her following works.